On the quiet banks of the South Fork of the Catawba River, an unassuming mill town at the foot of Appalachia hides a decades-old secret identity. Each December the small town's 660 citizens deck the halls with half a million twinkle-lights -- every house, school, and business -- and North Carolina's very own Christmas Town comes to life. It looks like a real-life Thomas Kinkade painting. With dancing red and green lights flickering their reflections on the rippling lake, the twinkling seems to come from all angles. A sculpture of wire and glowing bulbs twisted into the words "Merry Christmas" stands high on a hillside by the Fire Department. History, or legend, says 64 years ago those 4-foot letters could once be seen glowing all way in Belmont, the next town over. 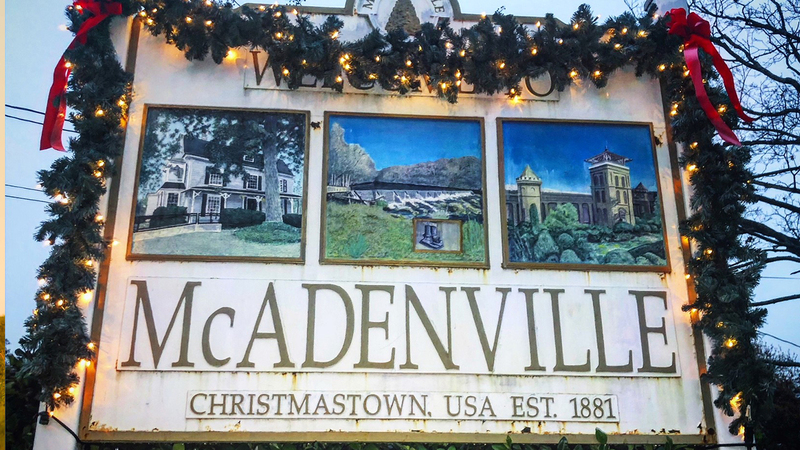 "This is our Christmas gift to the world," said John Bailey, who owns McAdenville Table and Market on Christmas Town's main street. "It's completely free to come visit the displays and drive through the town." The lights aren't the only reason this town is bright. The citizens are full of holiday spirit, with children shouting "Merry Christmas" at the 600,000 visitors driving through the town each December. 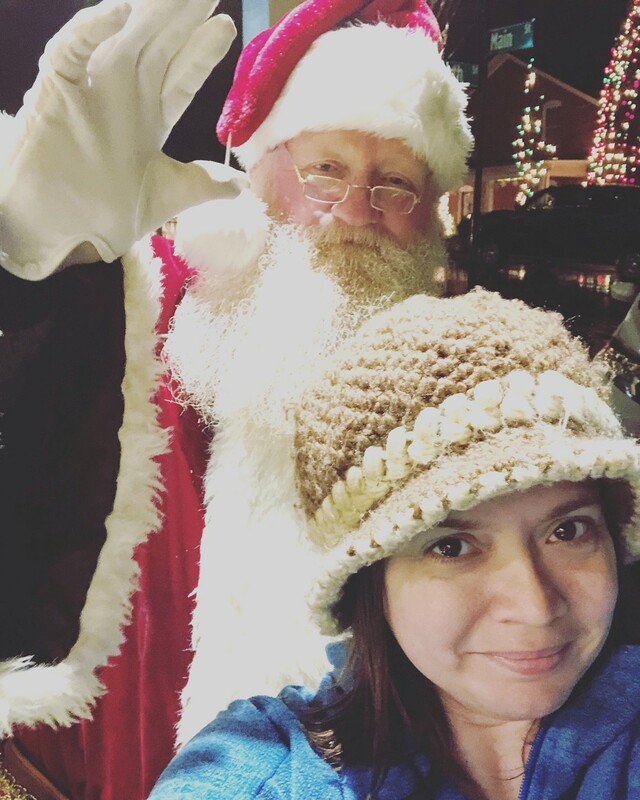 Visitors turn off car radios and roll down the windows--the sound of spontaneous caroling fills the streets, and chiming bells ring out joyfully. As if by magic, the chanting bells echo just as loudly from one end of town to the other, so everywhere is filled with holiday cheer. Store windows glow with inner warmth, selling hot chocolate and Christmas trinkets for loved ones. Santa waves at the passing cars, bellowing "Merry Christmas! Ho ho ho!" How do you get an entire town to collaborate, decorate, and work together to create such an enormous feat? "Everyone who lives here wants to be part of Christmas Town. People only move here because they are excited to be part of the tradition and the culture," Bailey said. The origins of Christmas Town sound like something out of a classic Christmas movie. "It began with four trees being decorated," Bailey laughs, "and now it's four thousand!" And it was all built on the generosity, goodwill, and holiday spirit of two founding families: The Pharrs and the Carstarphens. In the early 1880s, McAden Mills (later McAdenville) became the first community in North Carolina with electric lights. Thomas Edison visited the mills to install an electric generator, which lit the mill windows at night. Excited flocks of people traveled to see the "lights in a bottle," an apt description for early light bulbs. Just a few short years prior, the entire area was considered wilderness. Colonel Rufus Yancey McAden purchased the land in hopes of building a community to provide stability for families, many of whom were recovering from the destruction of the Civil War and Reconstruction. He built McAden Mills as a carefully-planned, comfortable community where families could re-establish themselves. "To entice people to 'come to the wilderness' and work, he offered employee housing built of brick," Bailey said. Entire families could move into a beautiful and sturdy home, as well as receive a paycheck, in return for working in the mills. According to census records, many struggling families traveled down from the North Carolina mountains to settle McAden Mills. McAden designed the mills to look like castles, creating a picturesque landscape, something North Carolinians would not typically see in the late 1800s. The stone turrets with glowing windows and electric lights, along with the classical brick duplexes, gave McAden Mills a remarkable and memorable skyline. Today, on the stretch of Christmas Town's main street, these historic brick duplexes with white columns and trim, and castle towers with spiraling twinkle-lights, create a vintage Christmas masterpiece. Before every inspirational Christmas story, there must be a struggle. In the 1930s, the Great Depression impacted the mill workers of McAden Mills. Many employees unionized for better pay and working conditions and the mills ultimately shut down, leaving many families without a paycheck -- or even coal to warm their homes. But in 1939, William J. Pharr saw the great potential of the little town and purchased the three closed plants, as well as the historic village houses. He even moved his family to McAdenville, a show of their love and commitment to making the community their home. Their philanthropy and charitable spirit has been the foundation of the entire town ever since. It's little wonder, then, how such "goodwill toward men" would eventually manifest itself in dazzling lights, a Christmas gift for all North Carolinians. Harvey D. Roberts remembers the very first year in Christmas Town history. In the book McAdenville Memories he wrote, "I was one of the five original men who started (the decorating)." The men created the iconic "Merry Christmas" sign out of metal rods, strung up with lights. "We also put some stars on the Mill tower and a tree in front of the main office. "Mr. Pharr was so pleased he suggested we add some trees and decorations up Main Street the following year!" writes Roberts. "Every house was to be decorated and the power to operate any decoration was paid for by Mr. and Mrs. Pharr." "This is when Christmas Town, USA was born." Bailey's restaurant, McAdenville Table & Market, is a model of the town's love of historic preservation. Rather than destroying old buildings, the town re-purposes their beautiful classic structures. In another lifetime, Bailey's restaurant was one of McAden Mills' brick duplexes for employee housing. Later, it became the Abernathy Supermarket, before finally being taken over by McAdenville Table & Market. "I wanted to fill this building with as much town history as I could," he said. "The Carstarphen family, who married into the Pharr family, was generous enough to allow me to go through salvaged lumber and pieces from one of their old mills." The wine rack and bar tops were created from wood from Mill #1. "The bar is hard pine, likely over 250 years old," said Bailey. "Those black mineral deposits are from nails. These are important pieces of our history. We want people to be able to touch it, to connect with it." Rustic, stamped tin shingles, once part of Mill #1's roof system, now line the area above the bar. Beneath the barstools, a long steel footrest is recognizable, upon closer inspection, as railing from the Piedmont and Northern Railway in Belmont. It's over a century old. Perhaps the most treasured piece of history is the thick green book, well-worn from the fingers of hundreds of readers. The cover reads: McAdenville Memories. Inside are treasured photos and stories -- not just the "big stories" that make up most history books, but rather all the small stories, the everyday people, the little lives that create a whole town's story. For a town of only 600 people, this history volume is bigger than Raleigh's or Charlotte's. "Once, a woman and her elderly mother came in here to eat," shares Bailey. Like most patrons, the women flipped through the book while waiting for their food. "Suddenly, the older woman started crying," he recalls. "I asked her what was wrong, and she said nothing; she had just found a photo of a lost family member, and a brief story about their life." The women said they had never seen that photo of him before. "They turned a few more pages, and then they were crying again! Another family member. Our community is very connected," shares Bailey. "We celebrate the history of everyone." The Pharr and Carstarphen families emphasize community spirit, preserving history, helping local businesses, and sharing their own holiday spirit with the town. "The Carstarphen's have done so much for my business, I like to pay it forward by helping out other starting businesses, too," Bailey said. Christmas Town, USA is an example of generosity overflowing. 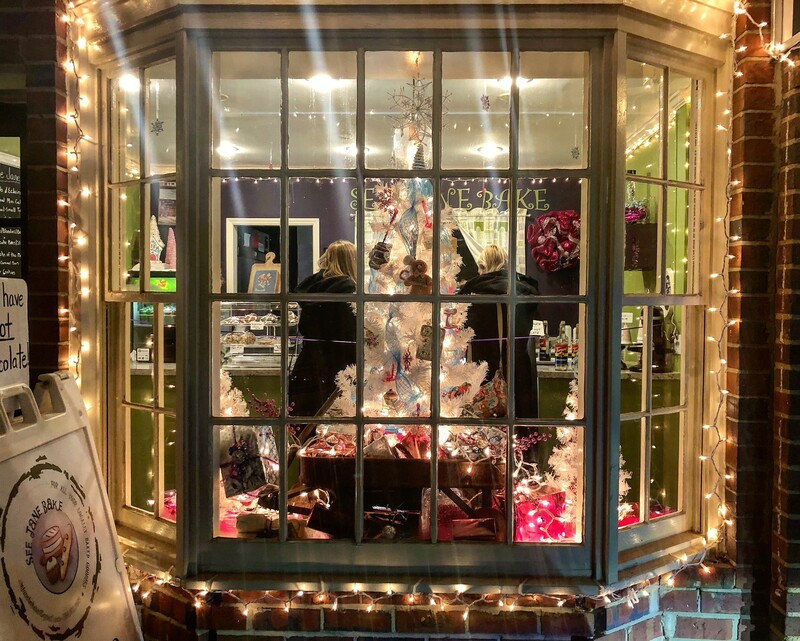 The half-million twinkle-lights, warm hearty food, and charming shop windows are the citizens' holiday gift to North Carolinians. After all, when an entire town is built on goodwill toward men, it can't help but shine at Christmas.